Miniature versions of baseball have been played for decades, including stickball, improvised by children, using everything from rolled up socks to tennis balls. The ball most commonly used in the game was invented by David N. Mullany at his home in Fairfield, Connecticut in 1953 when he designed a ball that curved easily for his 12-year-old son. It was named when his son and his friends would refer to a strikeout as a "whiff". The classic trademarked Wiffle Ball is about the same size as a regulation baseball, but is hollow, lightweight, of resilient plastic, and no more than 1/8 inch (3 mm) thick. One half is perforated with eight .75-inch (19 mm) oblong holes; the other half is non-perforated. This construction allows pitchers to throw a tremendous variety of curveballs and risers. Wiffle balls are typically packaged with a hollow, hard plastic, yellow bat that measures 32 inches (810 mm) in length and about 1.25 inches (32 mm) in diameter. The game became popular nationwide by the 1960s, and is played in backyards, on city streets, and on beaches. The game is similar to baseball, and is designed for 2–10 players. 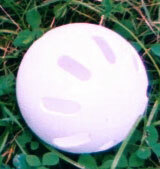 A wiffleball, showing the perforated half, which allows for easy curvature while pitching. Tournaments have been the driving force in modern wiffle ball and have been held in the United States and Europe since 1977. That year, Rick Ferroli began holding tournaments in his backyard tribute to Fenway Park in Hanover, Massachusetts. In 1980, the World Wiffleball Championship was established in Mishawaka, Indiana by Jim Bottorff and Larry Grau. With the explosion of the Internet in the 1990s, there are now hundreds of Wiffle ball tournaments played in the United States, most in the same place every year, with a few tournament "circuits". The World Wiffleball Championship remains the oldest tournament in the nation, having moved to the Chicago suburbs in 2013, after introducing regional stops over three decades in Baltimore; Los Angeles; Indianapolis; Eugene, Oregon; and Barcelona, Spain. The tournament is featured at #27 in the popular book, "101 Baseball Places to Visit Before You Strike Out." There is a national fast pitch tournament every summer held in Morenci, Michigan as well. This tournament determines which league is the best in the country. It is called the NWLA Tournament. Some wiffle ball enthusiasts have taken field construction to inspiring heights, having built fields to resemble major league ballparks. Thomas P. Hannon, Jr. authored a book, Backyard Ball, on his experiences building a smaller version of Ebbets Field. Patrick M. O'Connor wrote a book, Little Fenway, about building his versions of Fenway Park and Wrigley Field. But not all wiffleball fields have been modeled from major league ball parks. Some have created original fields, Strawberry Field in Encino, California being the most exquisite. Rick Messina spent over $700,000 constructing Strawberry Field, which features lights for night games, bleachers, and a press box. He also converted a neighboring house into a clubhouse/pub. Building fields can lead to controversy and legal issues. In 2008, The New York Times published an article about Greenwich, Connecticut teenagers who were forced by the city to tear down a wiffle ball field they had built because of neighbor complaints. In April 2011, the government of the State of New York proclaimed that wiffle ball, as well as kickball, freeze tag and dodgeball were "unsafe" and a "significant risk of injury" for children, and declared that any summer camp program that included two or more of such activities would be subject to "government regulation". The story became a frequent source of ridicule and amusement, with Parenting.com sarcastically commenting, "According to new legislation introduced in New York State, to survive classic schoolyard games like capture the flag is to cheat death. Wiffle ball executives originally thought the order was a joke. The company has never been sued over safety issues in its 50+ year history. The disapproval of people from across the nation pressured the New York legislature to remove wiffle ball and many other entries from the list of high-risk activities, such as "archery" and "scuba diving", that require state government oversight. Wiffle brand products play a central role in Wiffle Ball Summer: The Ride of the Elmoron. The nonfiction title was released in 2011 and details a bicycle journey taken by a man with a wiffle ball bat strapped to his bike frame. The final destination of his journey in the story is a large wiffle ball tournament in Lafayette, Ohio. In his book The Complete Far Side, cartoonist Gary Larson reproduces a letter he received after including a "wiffle bat" in his cartoon. The letter contains language from Wiffle Ball Incorporated's attorneys: "In the future, when you use the brand name WIFFLE, the entire brand should be capitalized, and it should only be used in reference to a product currently manufactured by The Wiffle Ball, Inc."
In science, it is frequently used by marine biologists as a size reference in photos to measure corals and other objects. ^ "What's 50, Curvy And Full of Air? ; It's the Wiffle Ball, Still Popular, Holes and All". The New York Times. August 14, 2003. Retrieved August 14, 2014. ^ "The Wiffle Ball, Inc. – A Brief History". www.wiffle.com. Retrieved March 29, 2017. ^ "Wiffleball: A Connecticut invention that keeps giving back". ^ "World Wiffle Ball Championship". ^ "101 Baseball Places to Visit Before You Strike Out". ^ "Official Site of the NWLA Tournament". NWLA Tournament. Retrieved June 20, 2018. ^ "Super 20". November 26, 2017. Retrieved March 25, 2019. ^ "Official Site of the Little Fenway Wiffle Ball Field Located in Jericho, VT". Little Fenway. Archived from the original on February 2, 2012. Retrieved February 1, 2012. ^ "Wiffle Ball Hits Home – Los Angeles Times". Los Angeles Times. October 11, 2000. Retrieved February 1, 2012. ^ Peter Applebome (July 10, 2008). "Our Towns – Build a Wiffle Ball Field and Lawyers Will Come". The New York Times. Greenwich, Connecticut. Retrieved February 1, 2012. ^ Blain, Glenn (April 19, 2011). "Classic kids games like kickball deemed "unsafe" by state in effort to increase summer camp regulation – New York Daily News". Articles.nydailynews.com. Archived from the original on December 24, 2011. Retrieved February 1, 2012. ^ "Playground Games Deemed Unsafe for Kids". Parenting.com. April 20, 2011. Retrieved February 1, 2012. ^ Blain, Glenn (April 20, 2011). "Wiffle Ball creators call scrapped New York state listing of backyard game as dangerous 'ridiculous' – New York Daily News". Articles.nydailynews.com. Retrieved February 1, 2012. ^ "State Officials Back Off Regulating Freeze Tag, Kids' Games". NBC New York. April 19, 2011. Retrieved February 1, 2012. ^ "Wiffle Ball Summer: The Ride of the Elmoron eBook: Geoffrey Arthur Drewyor, Art Drewyor, Eric J. Neeb: Kindle Store". Amazon.com. Retrieved February 1, 2012. ^ Larson, Gary (2003). The Complete Far Side. 2. Andrews McMeel Publishing. p. 71. ISBN 0-7407-2113-5. ^ "Live Webcams: Scientists Studying Corals Damaged by Oil in the Gulf of Mexico". Penn State Science. June 25, 2014. ^ "PHOTOS & VIDEO". Nautilus Live. Retrieved April 30, 2015. Dizzy bat (also known as Louisville chugger, D-bat, and The Spins) is a drinking game in which the participant chugs a full beer out of the holding end of a Wiffle ball bat. While the person is chugging, the surrounding participants count off in seconds how long it takes for the person to finish the full beer. The other players cannot stop shouting numbers until the batter turns the bat upside down to prove that every last drop has been consumed.The participant must then lean over and spin around with their forehead placed on the end of the bat for however long it took to finish chugging. Once the participant has finished spinning, another person tosses the empty beer can in the air, and the participant must hit the can with the Wiffle ball bat. If the participant misses the can, they must spin an additional three times and try again to hit it again. Elmore is a village in Ottawa and Sandusky counties in the U.S. state of Ohio. The population was 1,410 at the 2010 census. The Ottawa County portion of Elmore is part of the Toledo Metropolitan Statistical Area, while the Sandusky County portion is part of the Fremont Micropolitan Statistical Area. A 12-foot prototype is currently owned by Norman Foster. A 24-foot prototype is currently owned by Craig Robins. A 50-foot prototype acquired by Crystal Bridges Museum of American Art in Bentonville, Arkansas and installed in 2017.A new version of the Fly's Eye Dome standing at 24 feet was built in 2014 in Miami under guidance from The Buckminster Fuller Institute. Goodyear Ballpark is a stadium in Goodyear, Arizona (a western suburb of Phoenix) and part of a $108 million baseball complex that is the current spring training home of the Cleveland Indians and the Cincinnati Reds. The stadium opened to the public with a grand opening ceremony on February 21, 2009 and held its first Cactus League spring training baseball game on February 25, 2009. The stadium complex is owned by the city of Goodyear and contains the main field with a seating capacity of 10,311 along with several practice fields and team offices. The main entrance of the stadium is modern and uses surfaces mimicking dark stained wood and polished metal. The entrance houses a team shop, several concession stands and is decorated with Indians posters on the 1st base side and Reds on the 3rd base side. The entrance also has a third story terrace patio that can be rented for private parties. Outside the main entrance, the concourse features a 60-foot 6 inch fiberglass statue titled "The Ziz" created by artist Donald Lipski. The main entrance structure does not interfere with the inside the stadium which is a single tier of seating. Free standing polished metal awnings with fabric shades provide shelter from the sun down the third base line. Bullpens are located off the field in left and left center field. There is a large scoreboard in left field with general admission seating on a grass berm at its base. A cinder block concession stand in center field is painted dark green to provide a backdrop for the hitters. Right field features a second grass berm and a patio seating area and bar. The patio and bar area, like the Terrace patio, can be rented for private parties. There is a child play area with a Wiffle Ball field, inflatable batting and pitching games located on the first base side of the stadium. Goodyear Ballpark replaces Chain of Lakes Park in Winter Haven, Florida, as the Indians' spring training home, and Ed Smith Stadium in Sarasota, Florida, as the Reds' spring training home. The stadium is primarily used for baseball but also hosts community events such as the City of Goodyear's Star Spangled 4th, Fall Festival, and Home Plate for the Holidays. Jim Ford (born September 15, 1981) is an American film and television actor, stuntman, screenwriter and film director. He wrote and directed the short films Reconnaissance (2007), Gotta Go (2008), Wiffle Ball (2008), Timmy Text Message (2009), and White Zin (2010). John S. Glas Fieldhouse is a 2,399-seat hockey arena in Bemidji, Minnesota, United States. It was home to the Bemidji State University Beavers men's and women's ice hockey teams until October 2010. (The men's and women's teams play in the Western Collegiate Hockey Association.) The building, a part of a larger fieldhouse which contains the BSU Gymnasium and other athletic facilities. It was opened on November 17, 1967, and was dedicated on February 10, 1968. On October 1, 1975, the building was renamed in honor of John S. Glas, the acting president of the university at the time of the building of the arena. The Beaver ice hockey teams moved into the Sanford Center in October 2010. The Fieldhouse is now the practice facility for many Bemidji State athletic programs including Baseball, Softball, and golf. 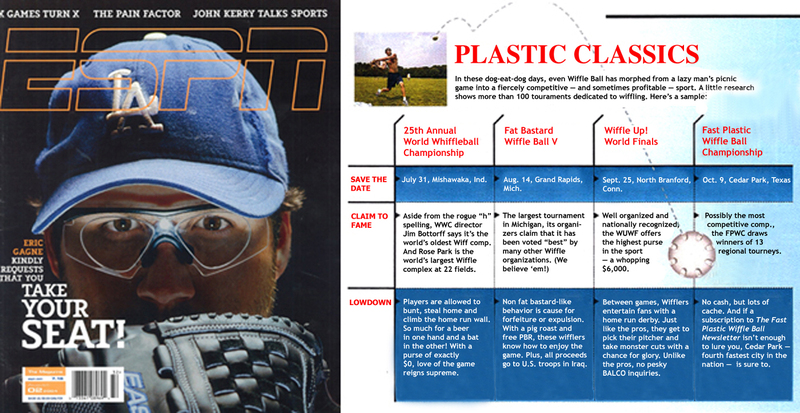 Bemidji Area Wiffle Ball began playing their games in The Fieldhouse beginning in 2014. A skill toy is an object or theatrical prop used for dexterity play or an object manipulation performance. A skill toy can be any static or inanimate object with which a person dances, manipulates, spins, tosses, or simply plays. Most skill toys are played alone, although some can be played with multiple people (such as footbag, juggling, and jump rope). Michael Leonard (born November 30, 1947) is a retired American television journalist who formerly worked for The Today Show on NBC. Leonard was a feature correspondent for the Today Show for 31 years and is known for his stories on everyday life and the unique creative way he presents his work. Leonard is also part of a family video production company, Picture Show Films. The company uses digital video exclusively and edits its projects on PowerBooks. Picture Show has produced critically acclaimed television shows; features for PBS, ESPN, and other news outlets; and videos for fund-raising, corporate training, and other projects. Picture Show is also credited for producing The Brendan Leonard Show, hosted by his son Brendan Leonard. In 1989, Leonard had the honor of having a G.I. Joe figure sculpted after his likeness by Hasbro. They named their character, Scoop, whose given name was "Leonard Michaels," in honor of the real newsman. Scoop was also in the communications field, just like his inspiration. (1)In 2006, Leonard published The Ride of Our Lives: Roadside Lessons of an American Family, about a month-long road trip he took with his parents and grown children in an RV. He also produced a television series chronicling the same trip. Leonard has four grown children, Matt, Megan, Kerry, and Brendan, and eight grandchildren, and currently resides in Winnetka, Illinois, with his wife, Cathy. Mike and his family have built a Wiffle Ball stadium in their front yard, Picture Show Park at the PineYards. Pickleball is a paddle sport (similar to a racquet sport) that combines elements of badminton, tennis, and table tennis. Two or four players use solid paddles made of wood or composite materials to hit a perforated polymer ball, similar to a Wiffle Ball, over a net. The sport shares features of other racquet sports, the dimensions and layout of a badminton court, and a net and rules somewhat similar to tennis, with several modifications. Pickleball was invented in the mid 1960s as a children's backyard pastime. Rent One Park is a stadium in Marion, Illinois that was completed in 2007. It is primarily used for baseball and is the home of the Southern Illinois Miners of the Frontier League. The stadium has a contemporary, non-traditional look, void of the common red brick and green steel common among ballparks around the United States. One of the most unusual features of the new stadium is the roof, which slopes down toward the field. As a result, foul balls hit by players can sometimes roll back down for spectators to catch. The Frontier League stadium is located roughly 120 miles southeast of St Louis on Interstate 57. There are over 3,400 standard armchair ballpark seats including wider chair seating behind home plate. Down the left field line and in the outfield is lawn seating that can accommodate over 2,000 fans. Rent One Park also has two picnic gardens: Budweiser Bullpen Bar-n-Grille down the right field line that can host as many as 250 people and the Rent One Picnic Garden located in the outfield with seating for over 500 people. The upper level features 14 luxury suites and an enclosed banquet area for approximately 200 persons. Rent One Park also contains an open-air entry plaza, home and visitor clubhouses, dedicated maintenance building, administrative offices, and team store. The scoreboard and video board are accompanied by 12 panels for advertisement on the right-field wall, beyond and above the bullpens. Down the left field side in the corner of the park is the Fun Zone, a children's play area with 4 inflatable games. The inflatable games include baseball, basketball, wiffle ball, and skee-ball. The company that holds the naming rights, Rent One, is a rent-to-own retail store chain. In baseball, a slider is a breaking ball pitch that tails laterally and down through the batter's hitting zone; it is thrown with less speed than a fastball but greater than the pitcher's curveball. The break on the pitch is shorter than that of the curveball, and the release technique is 'between' those of a curveball and a fastball. The slider is similar to the cutter, a fastball pitch, but is more of a breaking ball than the cutter. The slider is also known as a yakker or a snapper. Splatter Up is a T-ball toy released in 1988, designed by WET Design, under the Worlds of Wonder brand. The toy was later manufactured (marketed) by Buddy-L and Wham-O. The toy has been described as a "wet version of baseball" using a garden hose attached to a foot pedal to control the water pressure that funnels the water into a stream to push a wiffle ball up into the air so it can be hit with a plastic bat.In 1989, the Consumer Affairs Committee of Americans for Democratic Action recommended Splatter Up as a "safe and fun toy". Work Flow Language, also known as "WFL"
"WTF?" is an alternative rock song by OK Go from their third studio album Of the Blue Colour of the Sky (2010). It was written by Damian Kulash, produced by Dave Fridmann and released as the album's first single. The song is in 54 time, and the band has revealed that the song was inspired by Prince. West Goshen Township is a township in Chester County, Pennsylvania, United States. The population was 21,866 at the 2010 census. In 2013, Money Magazine voted West Goshen as the 10th best place to live in America. West Goshen has also been ranked in the top 15 places to live in America from 2014 to 2017 and is also at the top of best neighborhoods to raise a family in Pennsylvania every year. The headquarters for QVC is in West Goshen Township, though its address is in West Chester. West Goshen Township is also where the headquarters for A. Duie Pyle Trucking, Teva Pharmaceuticals, and Lasko Industries are located. There are more than 465 businesses which call West Goshen Township home. Wiffle golf is a recreational sport that is played using standard Wiffle Ball bats and balls. It is played on much smaller courses than traditional golf. In Wiffle golf, players take turns hitting Wiffle balls into objects such as trees, buckets, sheds, or bird feeders which are used as holes. Like normal golf, the object is to complete the course using as few strokes as possible. Generally, the biggest difference between traditional golf and Wiffle golf is that Wiffle golf is played in three dimensions, instead of on a level playing surface. Holes are generally above ground, and swings may be made either on the ground or in the air. Holes also tend to be made out of somewhat large objects. Because nearly anything can be made into a Wiffle Golf hole, Wiffle golf is an inexpensive game that can be played almost anywhere.